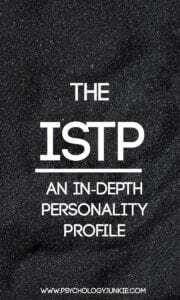 ISTP Personality Profile - An In-Depth Look at "The Mechanic"
ISTPs are one of the more rare Myers-Briggs® personality types. Making up only 5.4% of the US population, these types are both analytical and adventurous. They are known for their intensity, focus, and attention to detail. Using a combination of thinking and sensing, they enjoy solving problems and finding resourceful ways to navigate challenging situations. ISTPs have many titles including “virtuoso”, “crafter”, and “artisan”. All of these titles draw attention to the ISTP’s tendency to be a jack-of-all-trades, creative, and resourceful with tools and objects in the environment. But there is more to ISTPs than their creativity, and not all ISTPs are masters of tools…so what does it really mean to be an ISTP? Let’s find out! We’ll start by looking at their cognitive function stack. Not sure what your personality type is? Take the most accurate free online indicator here. (This is an affiliate link). The dominant function of the ISTP is called Introverted Thinking, or “Ti” for short. Ti gives the ISTP an intensely independent intellectual mindset. They combine a practical, level-headed demeanor with a deeply analytical way of looking at the world. They are fascinated with grasping the underlying principles of how everything works and is put together. As children (and even adults), ISTPS can be found taking things apart, analyzing them, rebuilding them and optimizing them. They love fixing things, solving problems, and figuring out puzzles and logical truths. As introverted thinkers, ISTPs are constantly organizing and refining their “mind bank” and categorizing everything into more precise internal units. The truth is what matters, not rules, not convention, not procedure. ISTPs want to integrate as much data as possible into their understanding of the world. They take time to make decisions, commitments, and to subscribe to “universal truths” because they want to collect as much information as possible before they put their stamp of approval on anything. One of the best ways to understand introverted thinking is to compare it to extraverted thinking, the process that ISTJs use. Extraverted thinking is focused on efficiency, action, and organizing the outer world. TJs gather “just enough” information to complete something or make a decision. It can be rather impatient but it’s very much about action and decisions. ISTPs, in contrast, use introverted thinking. Introverted thinking is focused on accuracy, precision, and organizing the inner world. ISTPs will gather more and more information, constantly searching for more accuracy, more precise truth and better terminology. Because they are so focused on having a complete picture of anything before moving forward, they can seem like they’re procrastinating. Because they use introverted thinking, most of their analysis is done internally and can be missed by observers. ISTPs are often misjudged as being distracted or bored when really they are deeply analyzing a complex problem or trying to find a solution. Introverted thinking breaks things down to its components and strives to understand the roots of where everything comes from. Extraverted thinking is less concerned with understanding the components of everything, and more concerned with use and function of everything. You can see Ti at work in an ISTP’s language. ISTPs tend to pause frequently to find the most accurate, precise word to sum up what they’re saying. They are less likely to use “generalizations” and tend to get frustrated by people who do. When ISTPs perceive the world around them, they use a mental process called Extraverted Sensing, or “Se” for short. Se gives them an intense awareness of concrete details. They can take in a lot of data and stimulation and maintain a high level of alertness and attentiveness. What would over-stimulate other types, ISTPs are able to absorb with startling accuracy. ISTPs see the world around them in real time, notice things in explicit detail, and can respond to sudden changes quickly. They can be deeply analytical yet still aware of what’s going on around them and responsive to their environment. As children, many ISTPs like to use a combination of thinking and sensing to master hands-on activities like sports, music, playing video games, or crafting. They want to experience things in a tactile way to understand them. In school they tend to be labeled as kinesthetic learners. Se gives the ISTP strong observational powers and a utilitarian wisdom. This contributes to their skill in fields as surgeons, soldiers, technicians, mechanics, and even stuntmen (or women!). Se also gives the ISTP a strong desire for adventure and experience. ISTPs are often impulsive, thrill-seeking, and on a constant quest to challenge themselves. They usually dislike routine and prefer to mix up their lifestyle with new and novel experiences, especially of the recreational variety. They may take up skydiving, surfing, rock climbing, or horseback riding. They may use their attention to fine to make high quality pieces of art or furniture. There is almost nothing they can’t do when they really set their mind to it! As Se-users, ISTPs tend to spend most of their time tuned into the present moment. They are less concerned with what happened before or what could theoretically happen in the future, and are more concerned with optimizing each moment as it happens. This ability gives them an awareness and attentiveness that many other types can only dream of. Introverted Intuition, or “Ni” for short, is the third most-preferred function of the ISTP. This function is very different from the one we just discussed. While Se is all about immersing one’s self in present reality and concrete details and experience, Ni is focused on the future and theoretical, abstract connections and insights. In early life, ISTPs tend to repress this function. This repression can show up as a certain uneasiness about the future and a disinterest in making long-term plans. As ISTPs reach mid-life they tend to develop Ni and become more fond of using it. This shows up as them developing an interest in abstract or theoretical subjects or trusting their insights and hunches about the future more. They might start reading philosophical works or toying with hypothetical questions. They become more skilled at long-term planning and seeing future implications. Symbols might stand out to them more and they become more focused on the big picture. Intuition will never be as strong as thinking and sensing for the ISTP, but in mid-life they usually trust it and enjoy it more. Some ISTPs will develop this function more than others; it all depends on what they value personally. Extraverted Feeling, or “Fe” for short, is the ISTP’s inferior function. This tends to be their weak spot and can cause them to trip-up in daily life. They often feel uncomfortable using this function, especially when they are younger. As they get older, especially in their 50s and 60s, this function tends to become more trusted and more mature. Fe is all about connecting with the emotions and moods of other people and improving morale. It’s about sensing the “emotional temperature” of the people around you; the social cues, customs, expectations, needs, and wants of others. People who prefer Fe (EFJs, for example) tend to be very warm, accommodating, tactful individuals. ISTPs, who have inferior Fe, can struggle with knowing and understanding the emotions of other people or the needs that they are dealing with. They tend to feel uncomfortable in social gatherings where reliance on small talk or social pleasantries is expected. When they are in emotionally charged environments, even if those emotions are good, they might feel uneasy and unsure how to respond to people. There are times where ISTPs can use Fe in a positive way. They tend to appear reserved yet friendly and can surprise people by switching from being stoic and unreadable to warm and concerned, especially with those they care deeply about. When ISTPs are experiencing extreme or chronic stress they may fall into the grip of extraverted feeling. This makes them feel uncharacteristically emotional and out of control. They can become unusually hypersensitive or concerned with what others are thinking of them. They may misinterpret small details into the belief that others dislike them. You can find out more about the ISTP and stress here. ISTPs are usually very accepting, fun-loving partners. They enjoy showing their mate new experiences and going on adventures with them. An ideal date for an ISTP often includes recreational pursuits like hiking, canoeing, or even rock climbing! They are usually very responsive to their partner’s immediate needs and are eager to help them when there’s a problem that needs to be solved. They tend to be playful, affectionate mates who enjoy showing their feelings through action rather than words. The biggest struggle that partners of ISTPs face is dealing with their naturally reserved demeanor. ISTPs are notoriously hard to read and tend to keep their emotions under wraps. They don’t share their opinions readily because their thinking process is so internalized and private. While many other types think out loud and express their reactions openly, ISTPs do all of their processing in their mind and may not feel compelled at all to share their reactions to things. They don’t do this to be difficult, they just don’t often feel the need to lay everything on the table. This can frustrate partners who want someone who is more transparent or easy to understand in an immediate way. ISTPs enjoy taking relationships one day at a time, and can be wary of long-term commitments. They like to see where things go organically for a while before settling down with a lifelong mate. They are very independent and enjoy their alone time a great deal. Rushing to get married or make things “official” is not usually a priority to them until they’ve reached a deep level of intimacy. Problem Solvers: ISTPs are excellent at seeing solutions to complex problems and situations. They are extremely resourceful and can find creative, hands-on ways to get out of a crisis, organize an efficient plan of action, and find the most viable solutions to things that puzzle other types. Independent: ISTPs are very autonomous and intellectual. They don’t feel the need to conform to tradition or lean on society to feel self-sufficient. Analytical: ISTPs love to take problems apart and analyze them from the ground up. They are skilled at seeing creative solutions and finding ways out of blocked situations. They are deep thinkers who don’t mind taking their time to get to the core of a problem. Practical: ISTPs are known for their level-headed, realistic mentality. They know how to work effectively with what they have instead of getting lost in fantasies about what they wish they had. Honest: ISTPs make it a personal goal to be as truthful as possible. They hate sugarcoating things and believe it shows respect to be authentic with people. That said, they may keep their true feelings to themselves in cases where they think it would cause too much chaos or conflict to reveal them. Energetic: ISTPs enjoy being actively engaged with the world around them. They like to be involved in a project and rarely like to be sedentary for long periods. Spontaneous and Flexible: ISTPs tend to have fast reflexes and are able to adapt quickly to new and changing situations. They don’t need as much preparation time as many other types do to deal with new stimuli and unexpected changes. Great in a Crisis: ISTPs are usually able to keep a level-head in a dire situation because of their practical nature and fast reflexes. While other types might waste time panicking, ISTPs are quick to find solutions and resources. Overly Private: ISTPs are naturally reserved, but some take this tendency too far and don’t let anyone in. They may keep their personal feelings so close to the chest that they aren’t able to get close to anyone or form deep relationships. Tactless: ISTPs focus on logic over feelings most of the time. While this isn’t always a bad thing, sometimes it can cause them to seem insensitive or to unwittingly hurt other people’s feelings. When they do try to show empathy they may feel awkward and uncomfortable. Easily Bored: ISTPs like to be actively engaged with the world around them or else analyzing problems and ideas that they personally find interesting. They get bored with small talk or theoretical conversations that don’t seem to have an immediate, tangible purpose. Overly Impulsive: ISTPs have a thrill-seeking side and aren’t afraid to take risks. Sometimes they will escalate a situation just to see where it will go or just to create some excitement. They may take physical risks without thinking through the long-term implications or they may escalate conflict in the heat of the moment only to regret it later. Commitment-Averse: While there are plenty of ISTPs in long-term relationships, many ISTPs put off commitment for as long as possible. They prefer to take things one day at a time and can feel trapped and oppressed in relationships where they are pressured to commit long-term. – ISTPs are the most likely type to deal with stress by getting upset or angry and showing it. They are also the type least likely to cope with stress by talking to someone or seeking professional counseling. – The preferred leisure activity of the ISTP is “playing with computers or video games”. – Occupational trends for ISTPs include “skilled trades”, “technical fields”, “agriculture”, “law enforcement”, and “military”. – With ESTPs, were at the highest risk for setbacks due to overdoing among those with long-term pain. – ISTPs prefer the academic subjects of math and practical skills. – The most important feature of an ideal job for ISTPs: “A stable and secure future”. – ISTPs are highly represented among male college scholarship athletes. Do you have any insight or experience you’d like to share? Let us know in the comments! Are You An ISTJ or an ISTP? deny his identity for the patriotism. And after, paradoxically, an obsession for his past. Andl ive for the present, yes, but then, “the big present”. Excellent, but why don’t use “Analyser Operator ” rather than “Mechanic” which is the most misleading and orients to other types like INTP or INTJ? hmmm….good point! I will have to think over changing the title without unhinging the link to the article 🙂 Thank you!